Creating a new category. How do you get prospects to be interested in doing something a new way. The importance of brand. How a brand strategy is much more than branding. 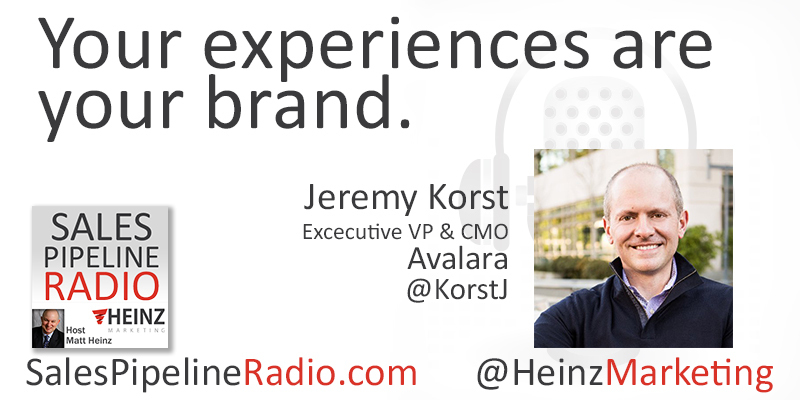 Jeremy Korst is Executive Vice President and Chief Marketing Officer of Avalara, a quickly growing Seattle-based SaaS company focused on transactional tax compliance for businesses of all sizes. Before Avalara, Jeremy was general manager of Microsoft’s Windows & Devices marketing group, responsible for the worldwide marketing and sales of Windows, and the highly successful launch of Windows 10. He also serves as a mentor to the University of Washington’s entrepreneurship program. Jeremy has served on various industry boards, as well as past Chair of the Seattle Accelerator YMCA Board of Managers.